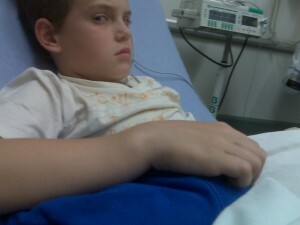 Sitting in hospital, he described his arm as wormy, you know, like a worm. He handled the pain and the situation really well. Prior to setting his arm, he was all hooked up to monitors and then they used an interesting drug to put him to sleep for just a short time. It took an amazing amount of the drug, considering that Hayden only weighs about 70 lbs. Not only was he given a decent amount of the drug, but while sedated, he moved a lot. Man, that kid is strong. I helped by trying to keep his legs still, but it was so hard to watch and be part of. 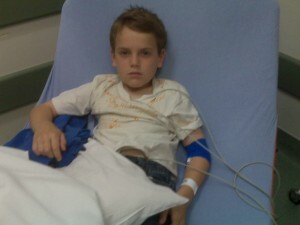 I ended up a little flushed and the nurses got concerned I might be the next patient. I sat down after his arm was set and the nurse handed me some oxygen. 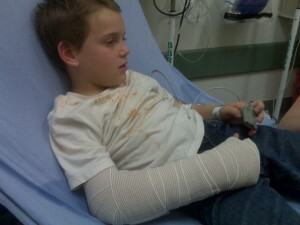 When all was said and done, his cast was on and he still had a great attitude. The set looked good in the second x-rays, but we’ll have an appointment with an orthopedist next week to see whats next for Hayden. A big thank you to all the Nurses and Doctors involved today. The ER is never a fun place to be, but it can be made a lot worse by bad doctors and nurses. He’ll get a real case next week, so if you’re around, please make sure and sign his cast, I know he’s looking forward to that.